Background: The purpose of this study was to assess the accuracy of magnetic resonance imaging (MRI) in evaluating Crohn disease (CD) activity. The intestinal inflammatory activity is usually present in patients under pharmacologic treatment, despite their clinical remission. Methods: Twenty patients with CD, all under pharmacologic treatment, were prospectively studied by MRI at 1.5 T as a periodic control. Positivity of three acute-phase reactants was considered an index of biologic activity (BA). T2-weighted, T2-weighted fat-suppressed turbo spin-echo, and breath-hold T1-weighted turbo field-echo sequences, before and after gadolinium intravenous injection, were obtained. A negative superparamagnetic contrast agent was orally administered. The following MRI parameters were qualitatively evaluated by three radiologists at the level of the affected bowel and compared with clinical data: wall thickness (WT), wall T2-weighted signal (T2W), wall contrast enhancement (WE), amount of fibrofatty proliferation (FP), and T2-weighted signal of fibrofatty proliferation on fat-suppressed images (T2FP). The κ coefficient of agreement was calculated. The Spearman rank correlation was used for the analysis of clinical and radiologic data. Results: Nineteen of 20 patients were in clinical remission (Crohn Disease Activity Index < 150). On the basis of laboratory tests, nine of 20 patients had biologically active disease. An excellent correlation was found between BA and WE, T2W, and T2FP (0.900, 0.927 and 0.961, respectively; p < 0.0001), and a lower correlation was found between BA and WT and between BA and FP (0.78 and 0.62). Excellent statistical correlation was also found between WE and T2W and between WE and T2FP (0.876 and 0.892). 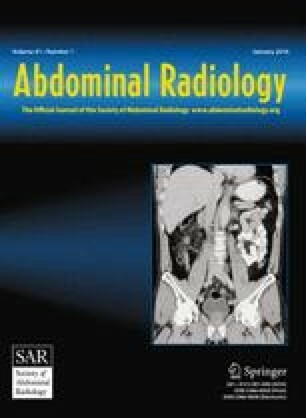 Conclusions: An excellent statistical correlation was found between biologically “active” disease and the following MRI parameters: wall gadolinium enhancement, wall hyperintensity on T2-weighted fat-suppressed images, and hyperintensity of fibrofatty proliferation on T2-weighted fat-suppressed images. Therefore, MRI can be valuable in assessing CD activity. Key words: Magnetic resonance imaging—Crohn disease—Crohn disease activity.